Hi Roadies! Do you ever find yourself drawn to the same colors? I love to use corals, pinks, and yellows in my projects. Today I made a layout of my daughter and tried to stick to a peach/coral/pale pink color scheme. 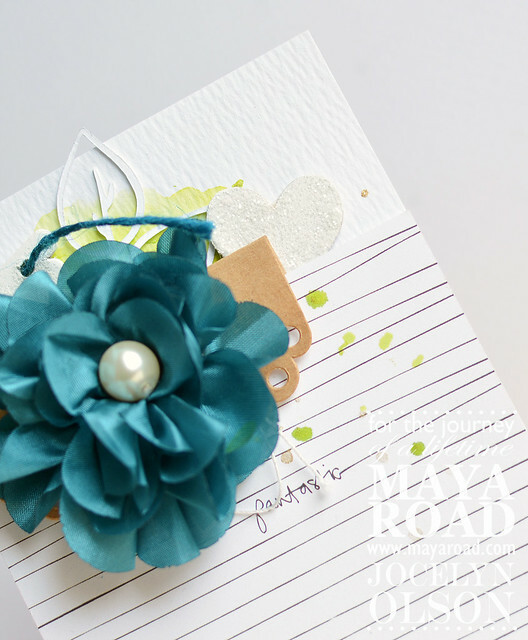 Fortunately, Maya Road has many embellishments in the same colors, which makes it easy to coordinate colors. I don't make layouts often enough, but I typically make 6x8 layouts like this one. I did some simple watercoloring with Maya Mists in the background and layered papers and the photos on top. For the embellishments, I looked at my Maya Road supplies and picked out embellishments in a monochromatic scheme. If you don't have enough in one color, you can alter most of the embellishments (like I did for the wooden heart). I layered the Coral Resin Nesting Bird over a scrap of doily, and added the Alterable Wood Heart and Wise Owl Resin. For the heart, I painted it with a thin coat of gesso, and once that dried, I sprayed it with Pink Grapefruit Maya Mist. Above the heart, I added the adorable Resin Bunny. The embellishments were placed to create an implied circle, so I die-cut the Geometric Leaf out of patterned paper and pointed it up to fill-in the visual circle. For the top corner, I stamped the sentiment and added the Vintage Tassel, Pretty Resin Bow, and a couple of sequins. Thanks for stopping by! All of the Maya Road supplies are linked below. Hello sweet Roadies! It's Yasmin on the blog today and I hope everyone is enjoying summer.. I have a Canvas mini album with a new video tutorial to share with you today. I hope you all enjoy it. So here it is! I've had such a blast making this. I've used so many lovely Maya Road embellishments. Almost all of the flowers are Maya Road, the vintage key and the leafs are also Maya Road. Here is the video tutorial on who to make the cover of this lush mini album. I left out the insides so it wouldn't be lengthy video to watch. We only have 10minutes to spare right?! It's super thick and I punched a whole on each side of the cover to pull some seambinding ribbon through so I could hold it together. I've added some extra pages by using some of the Maya Road packs as sturdy insides and covering them with paper and embellishments. Thank you so much for joining me today! This mini would be awesome as a wedding gift using an Instax camera photos and glueing them in on the day! Have a creative monday! Hello Sweet Roadies! Yasmin here today with my first post ever for Maya Road! Shaking in my pants because it's also my first ever blogpost with a video tutorial! 2015 is a year for trying out new things and I dare you all to try out something new today! :) Anyways let's get cracking! I wanted to scrap this prescious photo of my youngest son who was born 7 weeks prematurely.. So he needed some extra help in the start of his life. I've used loads of different Maya Road products on my layout like Kraft Doilies, Kraft Stars, Maya Mist and Chipboard Stars. Isn't this resin deer the sweetest ever? Thanks for stopping by our blog today! See you soon! Hi Roadies! We're excited to back back with more projects from our Guest Designer Yvonne Yam. Today she has two projects to share with you each with Yvonne's beautiful distinctive style. We love this gorgeous 8.5x11 layout by Yvonne. She's used Maya Road Mist, stencils and rhinestones to create the soft and lovely and background. 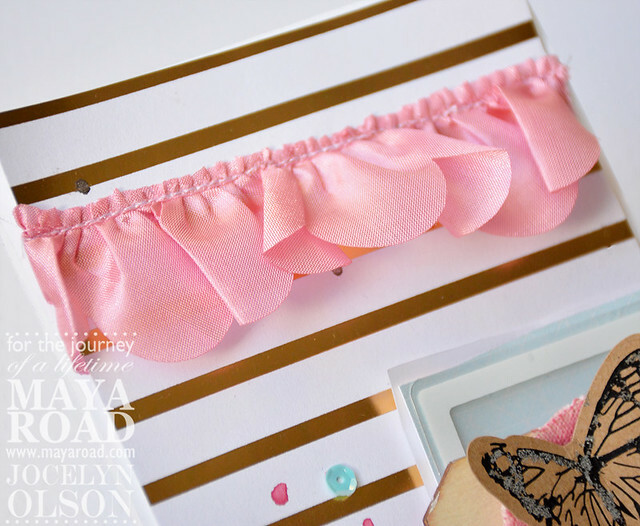 It matches beautifully with the Tu-Tu Tulle Flower embellishment. Yvonne has used the Framed Sayings Kraft pieces as a great way to mat photos and add them to the design. All the sweet insta sayings support the journaling on the page in a unique way. Check out the fun border at the bottom of the layout. It's made up up lace tape, paper twine cording strips and scallop edge trim. It's a great way to add interest and ground the bottom of the design. Maya Road Supplies Used: Framed Sayings Kraft Pieces-white, Jonathon chipboard Alphabet, Vintage Lace Tape Cinnamon Bear, Satin Scallop Edge Trim- Saffron, Tu-tu Tulle Flowers - Ballerina Pink, Paper Twine Cording (Carnation and Canary), mist (pink grapefruit). For this card design, Yvonne has once again used a beautiful mixed media approach to create interesting and colorful background. It's created with spray inks. We love how much energy all that color has. 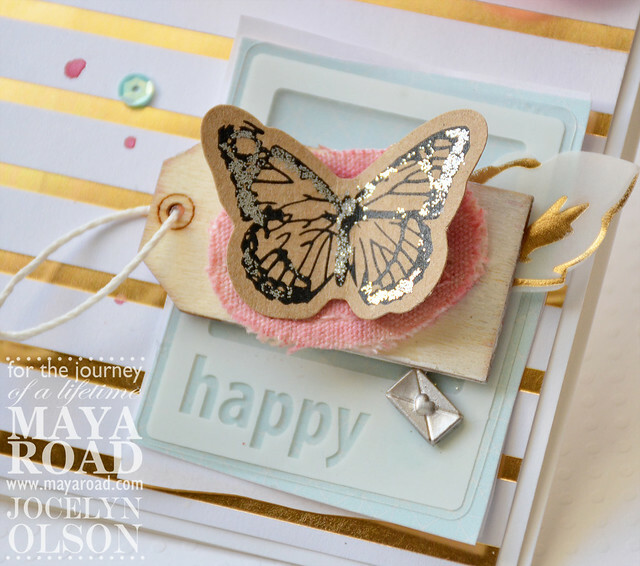 Maya Road has so many wonderful colors of embellishments and other product that it's easy to add textural accents to pick up the colors used in the background. Maya Road Supplies Used: Vintage Lace Tape - Sunshine Yellow, Satin Scallop Edge​ Trim - cream, Vintage Felt Posies - Cherry. 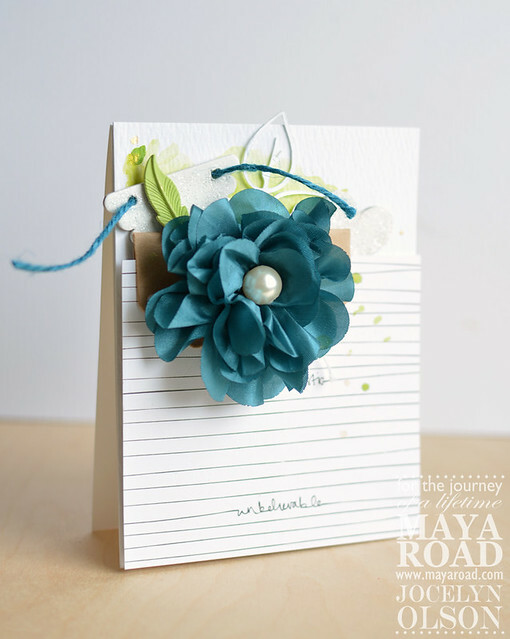 Thanks so much Yvonne for sharing all your beautiful Maya Road inspiration with us! I know it's not wintry everywhere, but where I live (South Dakota), we have a seemingly endless winter. Among all of the cold and snow, it's nice to drop a cheerful card in the mail for a friend. Sending some early spring cheer is nice, right? Using my glue pen, I traced around the Kraft Vintage Butterfly, and then added glitter. I added dye ink and water and placed the Mini Canvas Tag in it. The Love Note Charm was dipped in silver gilding. I whitewashed the edge of the Wood Shipping Tag with white paint. I added some Pink Grapefruit Maya Mist, but I felt like the card needed one more item. I decided to add the gorgeous Rose Scallop Edge Trim across the top. I think I'll be adding this trim to more cards! Next, I made a card with a "pocket:"
First, I did some watercoloring with the Green Apple Maya Mist. Next, I added foam tape to the patterned paper and then tucked several trinkets inside. Like the first card, I altered the products, like adding glitter to the Mixed Scallop Mini Triangle Banner and Heart Chipboard. For the Antique Feather, I painted it a lime green. I thought the colors looked good with the gorgeous Teal bloom! Behind the flower, I also tucked the Kraft Envelope. The entire envelope is tucked behind the patterned paper with the flower adhered to it. Wouldn't it be cool to add a hidden note or gift card? Thanks for checking out my first post! Hello Roadies! Kimberly here with a little break from the holiday projects. But the great part about this quick and easy canvas is, you can give it as a gift! My favorite part of this project is the rolled flowers. Let me show you how easy it is to create these with some products from Maya Road! Start by spraying Red Pepper Mist on your Alterable Crochet Trim on a surface that is protected. Once dry, begin rolling the trim starting at one end of the trim. I found that if I rolled it along the base of the trim, it was much easier to control and added to the overall fullness of each flower. Once you reach the end, apply a glue meant for fabrics and hold in place for a moment or two. Keep in mind, the longer the trim, the larger the flower. Experiment to get the size flower you need for your project. Here is the finished flower. I love the spots of white peeking through, the spots that didn't get a lot of misted color. So much more interesting this way! Then the leaves. 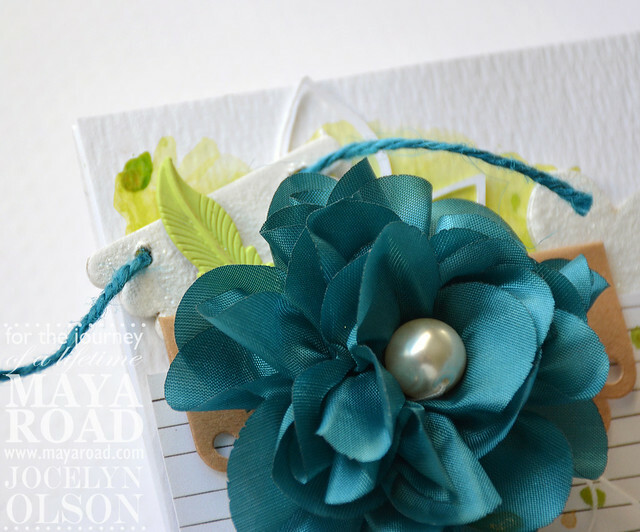 Maya Road Paper Twine cording is one of my favorite products! Its tissue paper that has been rolled into useable twine. But you can still unroll it and use it like I did. Unroll a length of the cording. Cut it in half lengthwise. Then fold the cording in half, creasing the fold, and adhering the ends together. Push the two ends towards each other and you have a leaf. Adhere the leaf underneath the flower and use on your project. These flowers add a beautful touch to add to any project! If you have a very small tree, that is. :) I saw this idea in an email from my favorite knitting store, and I knew the Maya Road products would work so well, I had to try it! I am so happy with how my little tree turned out, I hope you'll be inspired to make your own. First, I cut a triangle of green paper to fit in my frame. I started pulling out products and seeing how they fit inside the shape. I tried many combinations, that's what's so great about our embellishments, there are SO many!!! Once I had my configuration figured out, I added the tu-tu tulle trim in the avocado green to the triangle to give my tree a little more texture, then I started tying bows with the twines and cordings and fancying up the metals and woods with color. I misted the Wood Shipping Tag with Maya Mist Lime then stamped it with the Metro LC Alphabet Stamp set. I embossed a snowflake from the Snowflakes Mini Chipboard set and set it on one of the hexagons from the Hexagons Chipboard set, misted with Mustard Yellow Maya Mist. I dressed up the sweet little Oh Dear Resin Charm pink deer with a huge Vintage Paper Rose around her neck. I tied everything I could with various colors of the Solid Twine Cordings, Crafting Jute Cording, and Craft Cording Jute because hey, you can't have enough bows, can you? I also wrapped a Vintage Wood Beading Spool with twine too! You'll also notice the metal clips (Love Pendant Clip and the Christmas tree) are colored. I like to press mine in embossing ink and dip into powders, then heat emboss until I have a nice thick layer of color. I added some Sparkle Trims in Mermaid Blue and Party Pink to a few of the embellishments for some much needed bling. Then topped the tree with a Super Star Pin in Gold and added a few smaller Yellow Star Pins for fillers. In the end, my little tree full of eclectic ornaments makes me happy. Such a playful mix of products, I love how my new wall art showcases the wide variety of Maya Road products. Here's a full view of the tree with all it's decorations. Hi, Roadies! This is Leah checking in with a layout I created this week. Is it just me, or did this year fly exceptionally fast? Of course, I find myself saying this more and more each year. We haven't pulled costumes for Halloween, yet for this year, but I found myself flipping through some of the photos from last year that I haven't scrapbooked, yet. It's been so good to feel like scrapbooking again. I just figure life ebbs and flows, and right now, it's nice to be embracing that creativity again. I laughed and asked our oldest son why he was so serious for everything? His reply was that he was Harry Potter. Harry is always serious. And he's been through some tough stuff. Have a lovely evening! I can't wait to start seeing more autumn themed projects all around!